Nowadays there’s almost nothing you can’t get delivered to your door. (I just learned about an app that will send a seamstress to your door to tailor your clothes.) But there’s one delivery service you will not want to live without: Farm Fresh To You! This California-based service delivers organic produce fresh from its own family farm and other local farms directly to your home or office doorstep. Seriously. At your doorstep. It’s ridiculously easy to order and saves tons of time from going to the market and trying to find parking, which is always a nightmare. I was fortunate enough to have a box sent to me (courtesy of Farm Fresh To You) and I’m officially obsessed! 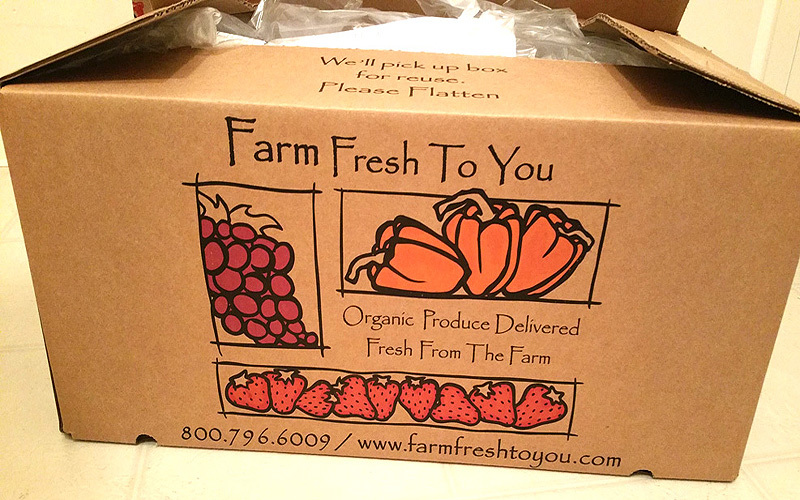 Unlike a lot of produce delivery services that buy produce from a warehouse and repack it (#lame), Farm Fresh to You supports local producers and has been growing organic produce on their own farms since 1976, so you can trust that 100% of the produce in your box is certified organic. Boxes start at $26 and you can change your box type, size and delivery frequency as often as you like. You can even schedule vacation holds. 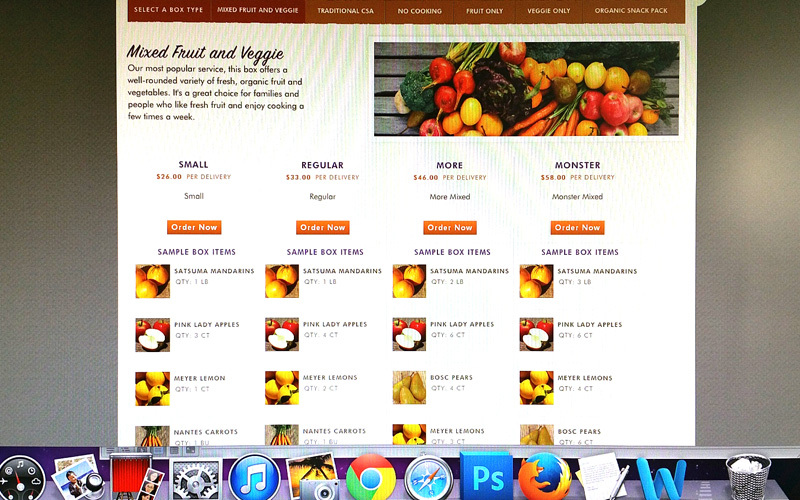 Visit www.farmfreshtoyou.com and you’ll get $10 OFF your first order using this CODE: MARL6267 — lovezzz! 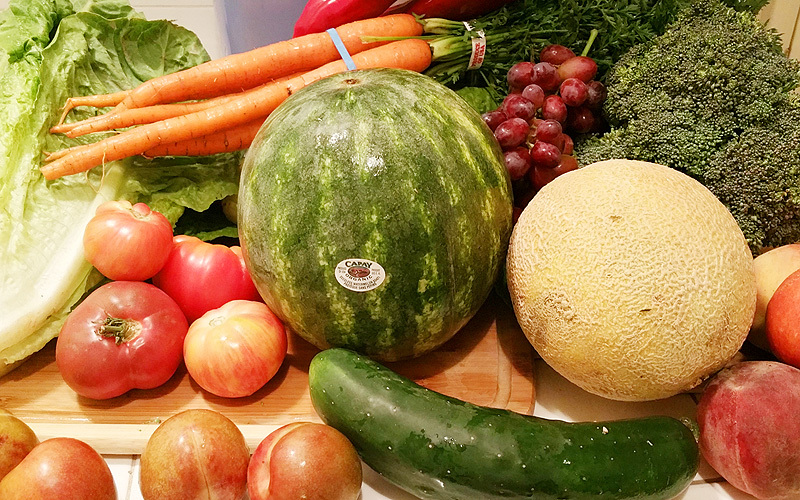 It’s like Christmas morning when you wake up and find a box that holds beautiful organic fruits and vegetables right at your doorstep. You can also add other non-produce items like honey or olive oil, even fresh flowers. It’s like having the farmers market literally coming to your door! One of the best things about Farm Fresh To You is that you can choose to automatically “exclude” items you don’t want to receive. (For me, that would be beets.) You can customize your box and make changes ahead of time by simply logging into your account online. The most popular box is Mixed Fruits & Veggies, but I ordered the No Cooking box because, well … ain’t nobody got time for that! Look at all these beautiful organic fruits and vegetables! It’s a cornucopia of goodness! I chose the No Cooking box in size More (aka large), so the selection was mostly fruit and only fast, easy-to-prepare vegetables. I’m tempted to try the Veggies Only box one of these days when I’m feeling more cheffy. I love that each box includes easy-breezy recipes featuring your box’s ingredients plus a breakdown list of items (I had no idea the red pepper is actually called a Corno di Toro) along with helpful tips on how to store your produce like: Never put tomatoes in the refrigerator – they will be tasteless and mealy. No wonder mine always lost flavor! Get a load of those melons! 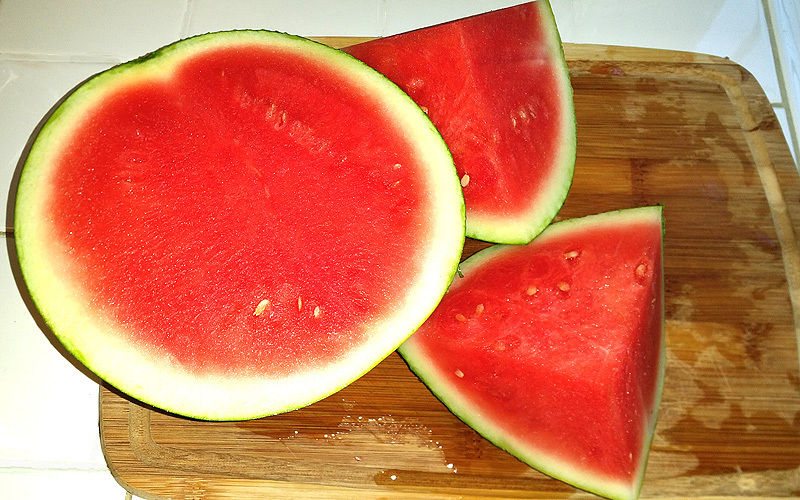 The organic watermelon was absolutely delicious and yes, it’s that red. This is not photoshopped. The only problem was that as soon as my husband and I were finished eating it we wanted more. Oh, and as for those grapes and cantaloupe? We ate them so fast I didn’t even have time to take a picture! How gorgeous is that salad? 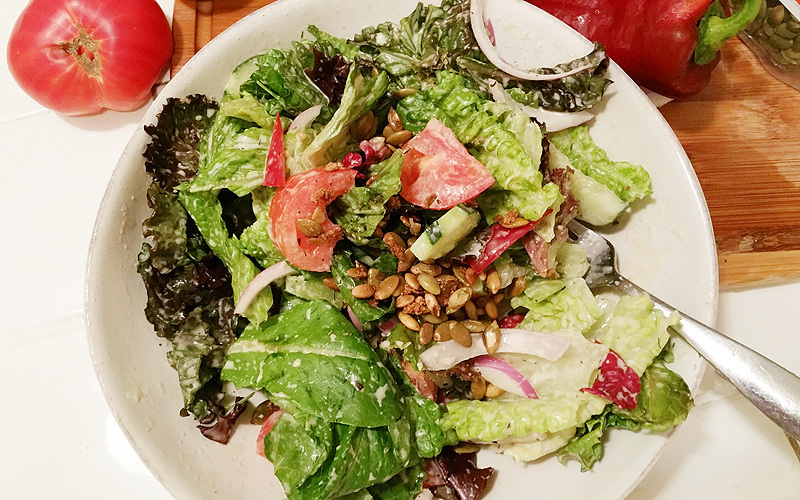 I made this with the Farm Fresh To You romaine lettuce, heirloom tomatoes, cucumber, corno di toro and added some sliced red onion, toasted pumpkin seeds and a little vegan ranch dressing from Follow Your Heart. The result: A delicious meal that took all of ten minutes and tasted so fresh we ended up making the same thing for the next two nights in a row! Another great thing about the Farm Fresh To You box is that you can use the ingredients in multiple dishes. 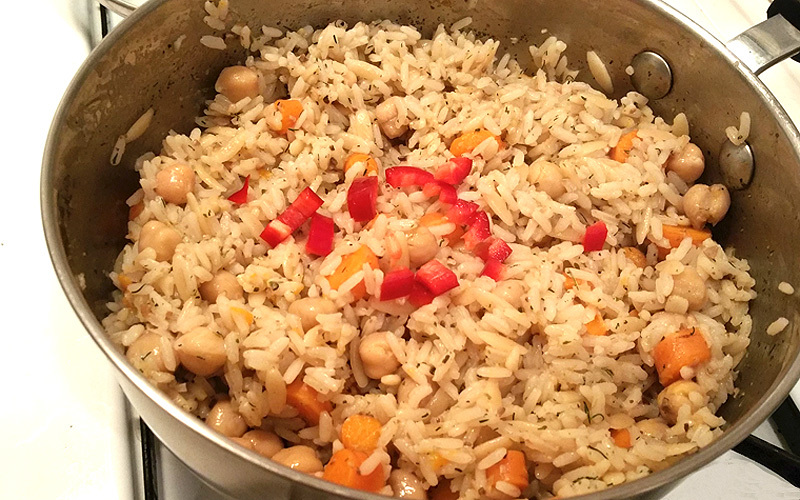 I made this garbanzo bean and rice side dish with the carrots and red pepper used in the salad. I never would have bought the corno di toro on my own (they look like they would be so hot!) but now that I’ve been introduced to its sweet and mild flavor I will definitely use again. This organic broccoli was so good! 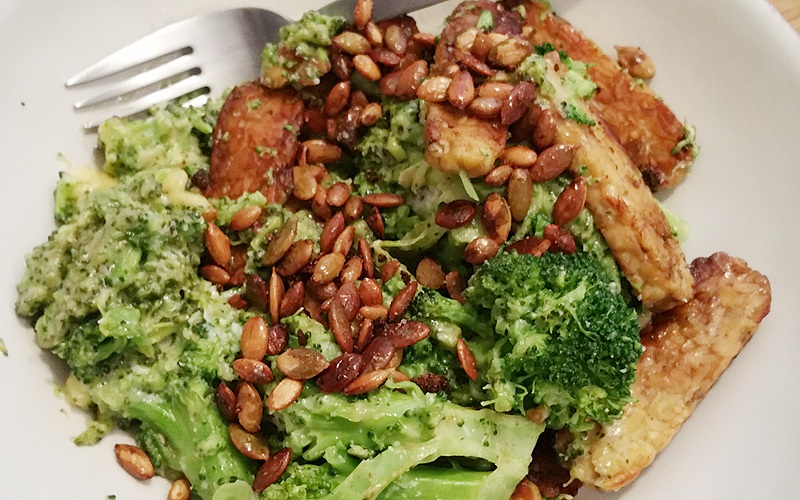 I simply steamed it and mixed it with some sauteed tempeh, garlic sauce and toasted pumpkin seeds. Easy and virtually no cooking. Farm Fresh To You not only offers extreme convenience, but it truly gives you a chance to experience each season by eating what is freshest and growing right now. When I go shopping for groceries, I oftentimes find myself buying the same things over and over again. With one box you can expand your culinary horizons and enjoy ingredients you might not have otherwise tried. After all, isn’t variety the spice of life? When you place your order with that code you’ll get $10 off your first box … that means you can get a Farm Fresh To You box delivered for just $16!! It’s available only in California (Northern and Southern) in select zip codes, so make sure you check out the site. Oh, and FYI you can cancel anytime for any reason. But I know you’ll love it. Can’t wait to hear (and see) what you think! That watermelon looks so good!!! With some lemon and tajin! I love coming home to fresh fruit and veggies. The box always has things I wouldn’t have thought to buy myself. It’s a fun and healthy food adventure! Love it mar. I have been thinking about trying something like this. Now I can see all what it looks like. thanks!